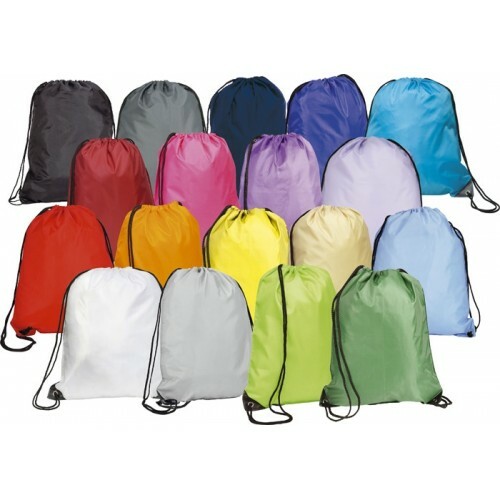 Large Drawstring Sports Back Pack Bag / Gym Bag - Double corded Backpack Bag. Large bag will take a box file with ease. Ideal for damp swimwear, PE kit, etc. Suitable for ages 5 to adult. 210d nylon / polyester mix. In stock: Navy, Red, Red Wine, Green, Apple Green, Royal Blue, Light Blue, Black, Purple, Yellow, Pink, Orange, Silver / Grey, White, Cyan / Turquoise, Graphite, Lilac. Biscuit is no longer available.